Ever since UCF Tent City Fall ’09, I’ve seem to become known as ‘that guy with the stainless steel lunch thing.’ As only one person has noticed, that ‘steel lunch thing’ is really the To-Go Ware 3-Tier Stainless Steel Tiffin Carrier. 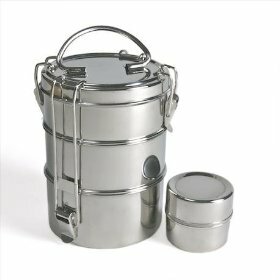 Tiffin Carriers are reusable lunch boxes (typically stainless steel) that are popular in India. I bought my tiffin for $25 + free shipping from Gaiam on eBay. Gaiam sells some products that are pretty ridiculous, but the To-Go Ware tiffin is definitely a fantastic item; I use it every day instead of cheap, throw-away, environmentally-unfriendly plastic! Even if you (admirably) refuse to buy/use plastic bags, the alternative (aluminum foil or wax paper) is highly unlikely to be recycled. Sadly, this is normally the case when finite resources (aluminum) get soiled by food (mustard, vegenaise, etc). IMHO, the most sustainable lunch practice is to buy something that’s easily cleanable, reusable everyday, will last forever, and is completely recyclable in the event that it breaks. The To-Go Ware tiffin matches these requirements. This tiffin is dishwasher safe and–unlike aluminum foil–can be reused over and over again. Because this tiffin is made from stainless steel, you can rest assured that it isn’t going to break for a *long* time–unlike the plastic crap that Walmart dishes out. Plastic has a limited ability to be recycled. Metal, on the other hand, can be infinity melted down and recycled. Personally, last semester I spent 14 hours straight on campus 2 days a week. I’m a pretty active person, so I eat a lot. So, it was important that my tiffin could carry a _lot_ of food. The 3-tier allowed me to stuff 4 sandwiches (2 per tier) and a salad each day. While this wasn’t always quite enough, it definitely held a _lot_ of food (especially by comparison of similar products). It really is surprising how much food you can fit into this (relatively) small device. Think: rice.